There has been a Significant Height Revision initiated by analysis of LIDAR data by Aled Williams and which was subsequently confirmed by a survey with the Trimble GeoXH 6000 to a hill listed in the Yr Uchafion, with the survey that resulted in this height revision being conducted on the 8th April 2017. Yr Uchafion - All Welsh hills at or above 500m in height that have 15m minimum drop. The list is co-authored by Myrddyn Phillips and Aled Williams. The name of the hill is Moel Bowydd and it is situated in the hills adjoined to the Arenig group in the northern part of the south-west Sub-Region of North Wales (Region A, Sub-Region A3), with the town of Blaenau Ffestiniog positioned to the south-west of the hill. The walk that took in this hill’s summit was suggested by Aled who had analysed this hill’s Uchaf qualification via LIDAR data, and the walk and survey were conducted on a beautiful sunny day with hardly a breath of breeze. 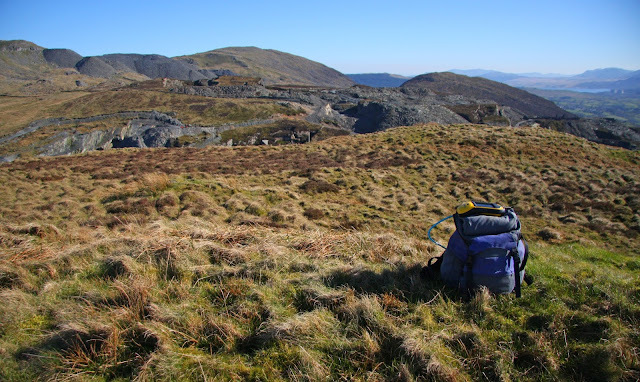 The hill can be accessed via public footpaths from its west, east and south, with Blaenau Ffestiniog being a good starting point for an ascent; an alternate and longer ascent can start from above Llan Ffestiniog using a track beside the course of the Afon Teigl. However, the summit of this hill is not on designated open access land, therefore permission to visit should be sought, but as the summit is relatively close to a public footpath and with open access land to its immediate north, common sense should prevail and if wanting to visit the summit there is likely to be no objection to doing so. The addition of Moel Bowydd to the list of Yr Uchafion was announced on Mapping Mountains on the 03.04.17, with its addition due to LIDAR data analysed by Aled Williams. LIDAR (Light Detection & Ranging) is highly accurate height data that is now freely available for much of England and Wales. Prior to analysis of LIDAR data the hill was not classified as contouring on Ordnance Survey 1:50,000 Landranger and 1:25,000 Explorer maps implied it did not have the required height to qualify as an Uchaf, with Ordnance Survey maps giving this hill an uppermost 490m ring contour and bwlch contouring between 480m – 490m. The term Significant Height Revision applies to any listed hill whose Ordnance Survey summit spot height has a 2m or more discrepancy when compared to the survey result produced by the Trimble GeoXH 6000, or a previous estimated summit height based on interpolation of contours. Also included are hills whose summit map data is missing an uppermost ring contour when compared to the data produced by the Trimble. As heights on different scaled Ordnance Survey maps are not consistent the height given on the 1:25,000 map is being prioritised in favour of the 1:50,000 map for detailing these revisions. The summit of this hill is easily distinguishable and is positioned at the south-western end of a grassy ridge overlooking the Maen-offeren and Llechwedd quarries. Therefore this hill’s new summit height is 500.5m (converted to OSGM15) which is 0.1m lower than the result produced by LIDAR data and 10.5m higher than the 490m uppermost ring contour on Ordnance Survey 1:50,000 Landranger and 1:25,000 Explorer maps.